“A hooded vigilante in the war on drug crimes, Tyrone Johnson uses powers of darkness as Cloak. Created in 1982 as to face off against Spider-Man (albeit in sort of an anti-heroic fashion), Cloak and Dagger were, from their very inception, intended for a spin-off-driven future. It sort of didn’t quite work out so much that way for them, but they have nevertheless retained a cult-classic status, which proved enough for them to get a TV show last year. Time will tell if this is what escalates them beyond cult status. In the mean time, they’ve both just been added to the ranks of Marvel Legends. Today, I’ll be looking at their Marvel Legends debut. 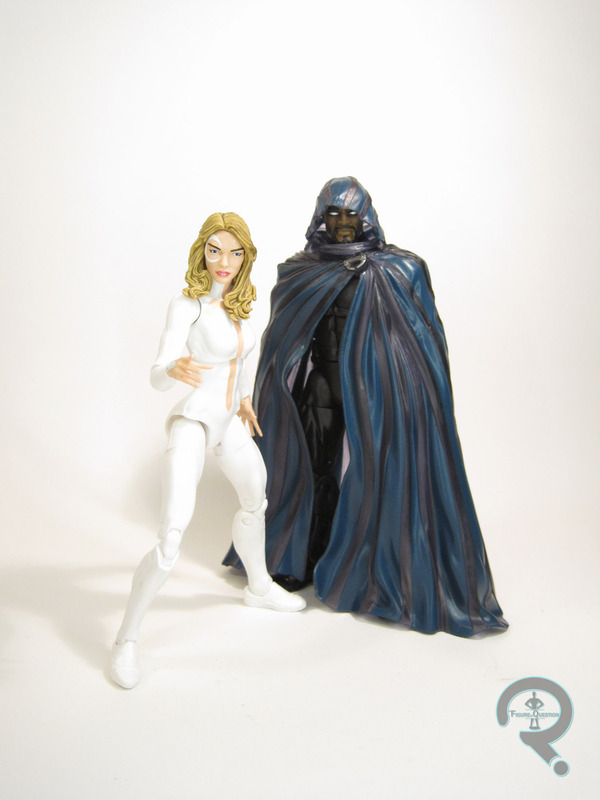 Cloak and Dagger are figures 3 and 4 in the SP//dr Series of Marvel Legends. This marks the characters’ debut in this style, though their second figures from Hasbro, who also offered them in their Marvel Universe line. Cloak stands 6 1/2 inches tall and he has 32 points of articulation. Has the articulation is, of course, slightly different than “uses the articulation”, which thanks to the titular cloak, Tyrone doesn’t really do. Though he’s built on the Reaper body, it really amounts to little more than elaborate cloak-hanger. He does get a different set of hands than we usually see on this body; they’re outstretched in an open gesture. You aren’t going to see them much, but at least this way they’re a bit different. The previously mentioned cloak is an all-new piece. While articulation-restricting, it’s quite a nicely sculpted piece, and it hangs well on the Reaper base body. Its nice to see that Hasbro’s gotten over their trend of bad capes, though it’s a little bit unfortunate that this is the only option he have for displaying him. Cloak gets a new head as well. It’s clearly a later-in-his-career version of Cloak, as denoted by the goatee. Its an interesting choice, but not one that really makes for much of a difference in the character’s depiction. 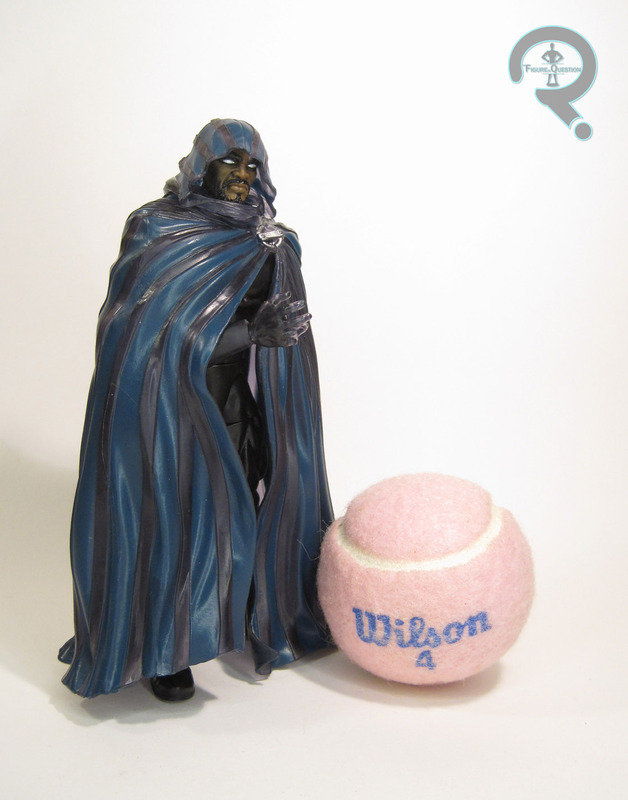 The hood of the cloak is fixed to the head, separate from the main cloak, as has become Hasbro’s standard for such designs. The paintwork/color work on Cloak is subtle, but pretty impressive. The cloak and his arms are molded in a semi-translucent plastic, which gives him something of an etherial quality, which definitely works well for the character. 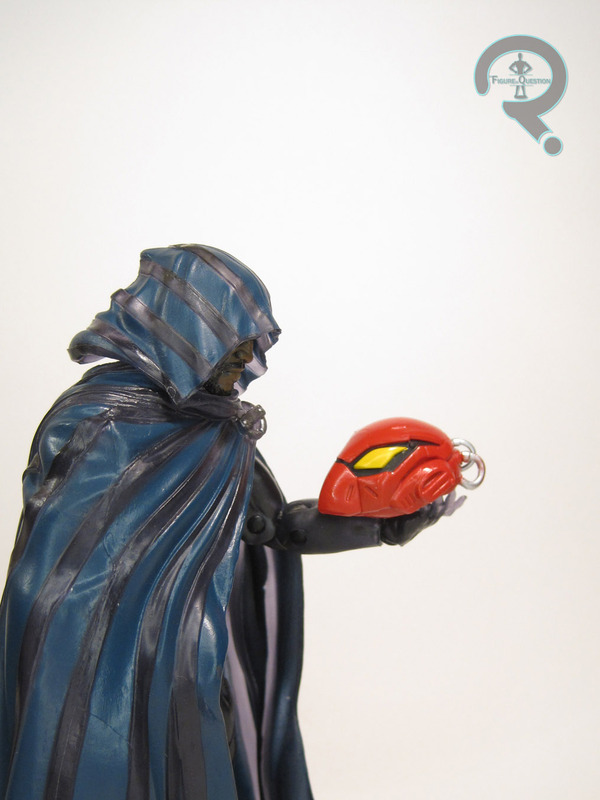 Though he doesn’t get any character-specific extras, Cloak does include the head to SP//dr. The light to Cloak’s dark, Dagger stands 6 inches tall and has 27 points of articulation. Dagger is built on the mid-sized female base body, a good fit for how the character is usually depicted. Like Elektra, she’s saddled with slightly more restricted elbows, but they aren’t quite as terrible for Dagger. Dagger’s one new piece is her head-sculpt, which is a really nice piece. The hair in particular really turned out well. It flows well with the body, its got a natural hang, and the detailing is nice and sharp. The rest of the work is dene via paint, and even then, she’s really pretty basic. The majority of the work is, again, on the head, specifically the hair, which gets some solid accenting, which helps it look more realistic and provides more depth to the sculpt. Dagger is packed with an effects piece, simulating her throwing her light daggers. It clips onto her wrist, and generally looks pretty cool. I’m always down for effects pieces. She also includes the torso of SP//dr, which is the largest and most important piece, so she’s got that going for her. I don’t really have a huge attachment to Cloak and Dagger, but I do think the two of them have a rather striking design going on, and they make for fun figures. Also, I really wanted to build SP//dr, so they have that going for them as well. There’s not a whole lot new going on with either of these, but that’s kind of reasonable given their designs, and the execution is solid. I purchased Cloak and Dagger from my friends at All Time Toys. If you’re interested in buying these two or other Legends figures, or are looking for other cool toys both old and new, please check out their website and their eBay Store.